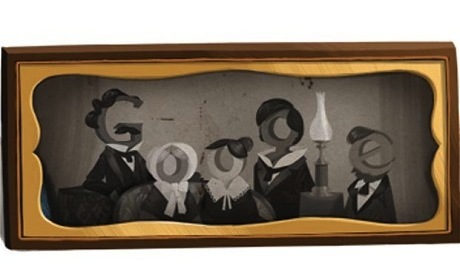 If you're a photographer, then whether you know it or not, you owe a great deal to Frenchman Louis Daguerre, so it's a good job that Google have chosen to celebrate Daguerre's 224th birthday with this entertaining Google Doodle. Daguerre was a French physicist who created the first successful form of permanent photography, in conjunction with Joseph Nicéphore Niépce, back in 1826. Niépce had been experimenting with the fact that silver carbonate or silver chloride and a chalk mixture darkened under the exposure to light, with the pair refining the process to build towards using it to produce photographs. Daguerre's experiments led him to expose silver-coated copper plates to iodine, producing silver iodide. He then exposed the plates to light for several minutes, then coated the plate with mercury vapour and heated to 75oC before finally fixing the image permanently to the plate with salt water. This was the first form of permanent photography, called a Daguerreotype. The Daguerreotype was presented to the French Academy of Sciences in 1839, following years of experimentation with the medium to perfect the process. At this point however, the image on the plate was still in reverse from the image that it captured, the image needed to be viewed from an angle due to its shininess, and it had to be protected from destructive fingerprints and the air in a glass fronted box. Nevertheless, photography had its foundations, and generations of photographers would take this basis and build on the medium, making it, what it is today.